Thomas W. Peatman, M.D. 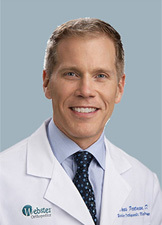 is an expert general and reconstructive orthopedic surgeon. He provides leading-edge options in joint replacement, including the anterior approach (MIS) to the hip, partial knee replacement, and out-patient joint replacement. He also renders the most comprehensive surgical and non-surgical care for all hip, knee and shoulder sports injuries. Click on the below mentioned tabs to know more about his services.